In addition, members have access to their profile, which lists the most recent address and other contact information they have provided to BNAPS, dues payment history, collecting interests, etc. Members can edit this information to keep it up-to-date and ensure uninterrupted receipt of BNA Topics . Members must log in using a password to access the members-only features. The login process and the way a password is obtained are described below. You can log in on the BNAPS Home page. Go to the Member Login button on the right side of the top menu bar. Click on Login to go to the Member Login page. 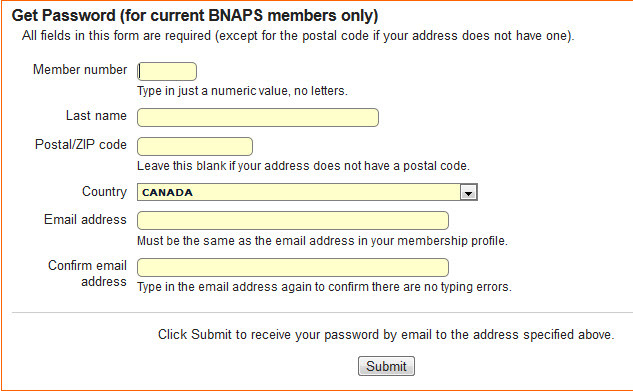 Your BNAPS membership number is on the BNA Topics mailing label. It is just above your name. In the sample image at right, the membership number is "1234". To log in, type in only the digits in your membership number. Ignore any letters that may be present on the mailing label. Password problems? See How to get a password below. If you don't have a password or have forgotten it, you can get a new one by email by filling in the form on the New Password / Forgotten Password page. After receiving the password, you should log in and change it to one of your own choosing so that you can remember it more easily. To do this, see Accessing members-only features below. You should get the email with the password no more than a few minutes after submitting your request. It is sent by the BNAPS webserver on behalf of the Webmaster (webmaster@bnaps.org). If you don't get the email within a few minutes, it may have been filtered to a junk mail or spam mail folder by your email service provider or your email client software. If it was your email service provider, you will have to retrieve the email by logging into your webmail account. If it was your email client software, the email will be in a junk mail or spam mail folder on your computer. After logging in, you are returned to the BNAPS Home page. The Member Login button in the top menu bar is replaced by the Member Routines button. My profile allows you to update your membership profile (postal and email addresses, collecting interests, etc.). The "Change password" menu item on the left side of the Profile page allows you to change your password. Dues renewal allows you to pay your membership dues by PayPal. Members only area lists content that is accessible only to BNAPS members. Members directory lists fellow BNAPS members whom you may wish to contact if you share similar collecting interests. Logout allows you to terminate your session. To access recent electronic editions of BNA Topics , go to the Horace W. Harrison Online Library.